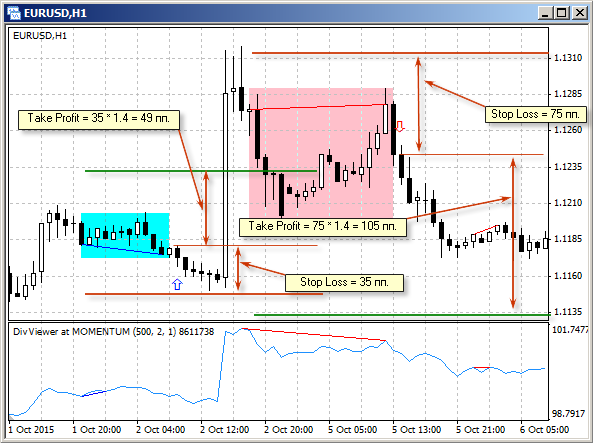 The Expert Advisor uses signals provided by the DivergenceViewer indicator. This does not require the indicator to be present in the terminal folder. The EA configuration parameters include the "Divergence parameters" block, which duplicates the similar parameters of the indicator. The EA opens deals when a divergence of a specified class is registered. The Stop Loss level is set behind the local extremum, reached by the price over the divergence formation period, at the distance of "Offset for Stop Loss, pts.". The Take Profit level depends on the distance between the deal opening price and the Stop Loss level. This ratio can be adjusted using the "Ratio of the TP size to SL" parameter. For the Expert Advisor to properly detect the divergences, it is necessary to specify the amount of bars, sufficient for the correct calculation of the base indicator values, in the "Start bars count" parameter. For example, to calculate the values of the William Blau base indicator with the parameters 8000, 1, 1, the chart is required to have at least 8000 bars. The detailed description of the Expert Advisor and thorough test results are given in the article The Divergence Expert Advisor.